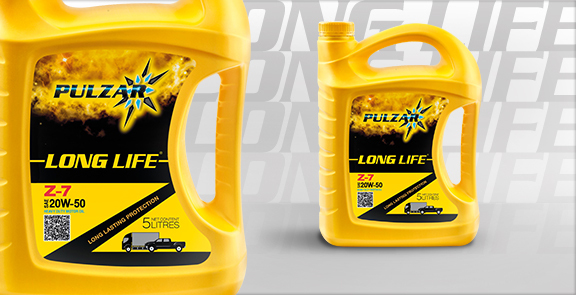 PULZAR LONG LIFE Z-7 MOTOR OIL is the ideal lubricant for heavy diesel engines. High quality base stocks and special additives help heavy truck and equipment engines run smoother, immediately. Unlike the other conventional lubricants, PULZAR LONG LIFE Z-7 MOTOR OIL will keep your engine running smoother, longer, thanks to our advanced Modified Release Technology (MRT). PULZAR LONG LIFE Z-7 MOTOR OIL offers truly long lasting protection by effectively keeping particles in suspension to extend the life of your engine’s oil and filter. It contains the latest dispersant technology and premium oxidation inhibitors prevent sludge and oil thickening caused by soot. Special anti-wear additives spread completely over all metal surfaces for maximum, long lasting engine protection, even in wide temperature ranges, throughout the oil’s service life. PULZAR LONG LIFE Z-7 MOTOR OIL is specially formulated for heavy-duty service in diesel engines in over-the-road diesel trucks, off-road heavy-duty construction equipment, mining equipment and farm vehicles. PULZAR LONG LIFE Z-7 MOTOR OIL can be used with complete confidence for extended oil drain intervals when combined with used oil monitoring maintenance practices. Always change oil as specified by the engine manufacturer to maintain your warranty. PULZAR LONG LIFE Z-7 MOTOR OIL is recommended wherever engine manufacturers specify the use of an engine oil meeting API Service Classification CF-4, CF-2, CF, CE, CD-II, CD, and SG, or any combinations such as CE/SF, CF/SF or CF-4/SG. It is available in SAE 20W-50. Always refer to the vehicle owner’s manual for correct viscosity.